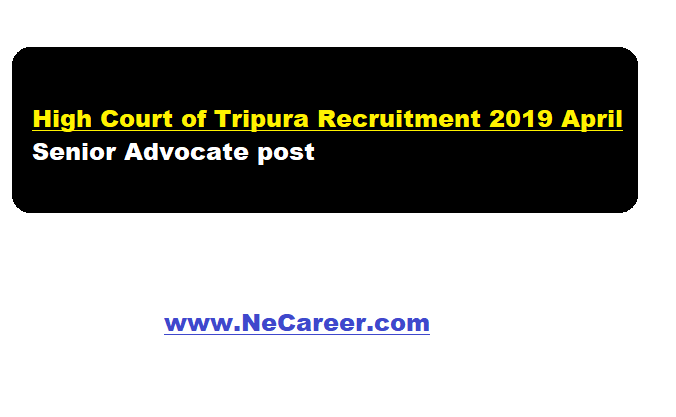 Tripura High Court Recruitment 2019 April :- Welcome to North East India's No. 1 Job Portal NeCareer.com .High Court of Tripura has published a job notification in April 2019. According to the recruitment, applications are hereby invited from the eligible Advocates having 10 year practicing experience at the Bar for designation as Senior Advocate in the High Court of Tripura as per the prescribed format available in the Official Website of the High Court of Tripura (http://thc.nic.in). Qualification/Experience : Candidates must have law degree and 10 years of practicing experience at the Bar for designation as Senior Advocate. The willing Advocates have to submit their applications, duly filled in, with necessary enclosures to the Secretary, Committee for designation of Senior Advocates, High Court of Tripura through e-mail (adebbarma@aij.gov.in) in pdf. as well as .doc format positively within 03(three) weeks from today. A hard copy of such application along with all necessary enclosures shall have to reach to the Office of the Secretary, Committee for designation of Senior Advocates, High Court of Tripura within the aforesaid stipulated period. Advocates who have already applied for designation as Senior Advocate in terms of the Notification No.F.29(6)-HC/2018/6077, dated 13.04.2018, issued by the High Court, needn't apply afresh. Office of the Secretary, Committee for designation of Senior Advocates, High Court of Tripura.